Replicawatches777.com seems to be an old fashioned fake watches online site. Why do I say that? Probably because it has that classic vibe, a look that is reminiscent for the first webpages on the replica market- the ones that 5 or even 10 years ago had friendly and easy to reach customer services, the ones that didn’t focus on creating a catchy website and adding thousands of models to their collection, but rather on offering the proper services and information to ensure customer satisfaction. Maybe, I’m mistaken. Maybe, Replicawatches777.com is just like the other countless new fake stores, but there is one sure way of finding out its true nature. Continue reading the below review and everything will be crystal clear. The page is pretty user friendly and intuitive. The white and light blue colors scheme is nicely complemented by large bright product images and by well-organized menus. Both the top and left side menu bars divide the collection into Swiss Made for Men, Japanese Made for Men and Watches for Women. And the diversity of available brands is quite impressive. This merchant carries some of the most popular watch companies in the world. What I like about its fake watches selection is the fact that it isn’t that wide. It is how all replica collections should be. A narrow offer for designs that are really worth buying- the best-selling models ever launched. The prices are really affordable. On Replicawatches777.com you can find either men’s or women’s watches that are equipped with a Swiss automatic movement or a Japanese automatic movement. The prices vary depending on the complexity and quality of the inside mechanism. For instance, Swiss replica watches cost about $300-$600 while Japanese fake watches are around $150-$250. Let’s face it. Anyone who adores these watches understands that these prices are very reasonable considering that the replicated watches cost $10,000 or more. The pictures of the watches seem to be pretty good quality. These are very clear, detailed and professional looking. But is this enough? Well, on the replica watches market it isn’t. The real issue with these pictures is that they are taken from several sources and they still have some different website names watermarked. What does this mean? Either that the store has changed its web address several times or that it just copies product photos from competitors. Be sure to ask for actual pictures of the replica before you buy it. I like the fact that the merchant pays a great deal of attention to the descriptions of these products. He has rich and very descriptive details for each one of its replica watches. This makes us understand better the quality of the knockoffs it sells. Replicawatches777.com can process payments by Visa, Mastercard, JCB and Gift Certificates. No other forms of payments are accepted. Very interesting thing is the fact that you can pay on this site with a Gift Certificate. It is the first replica watches site that provides this option. Of course, Western Union, Bank Wire or Money Gram would have been nice. On the website it is stated that orders are delivered by USPS, no matter what destination country you choose. I don’t get this. USPS is the US postal service, which isn’t available in other countries like UK or Spain. Probably, USPS really means EMS and they wanted to use a more elegant way of saying this. The thing is, EMS isn’t such an expensive delivery method, and still this page applies a $33 delivery fee to USA or $51 to UK. Plus, the estimated shipping time is about 7-10 business days. That’s a lot of time for such expensive delivery rates. I am pleased to note that the store offers a 7 days return policy. They call it a “7 days inspection period”. During this time you can test the replica watch and see if you are satisfied with it. If not, do not waste time. Contact Customer Service and request the return details. Of course, do not ignore the costs implied by this. There will be some stiff return costs and a restocking fee. If you add them up, I’m not sure if it is worth it. But the best part about its policies is the one free repairs warranty that covers any manufacturing defects. 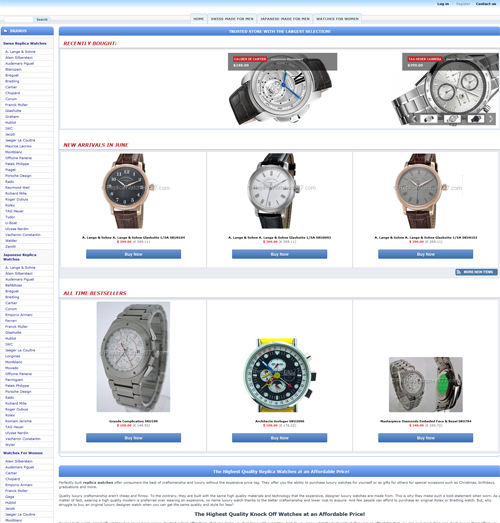 If you look on the Homepage or on the Contact Us page you get a very good feeling about Replicawatches777.com. It seems like a pretty decent and reliable company, one that offers excellent support by email and phone number. Still, I have tried their phone number- an Austrian phone number- and when I dialed it, it said “not valid”. I have also sent an email, but the next day there was still no answer. Bottom line, I was disappointed by what I believe to be a “fake customer service”. Replicawatches777.com is a store that makes such a good first impression, but it disappoints greatly after you find out more about its services and policies. The first thing that I disliked on this site was the product pictures that were watermarked with many different website names. Next, there is the part where it hides the fact that its packages are shipped with EMS and the delivery fee is pretty pricey. And let’s not forget about the so called customer services and the listing of an invalid phone number. The things that I did like about this store are the friendly website, well organized collection, affordable prices and the refund and repairs guarantees. if you return something, you will not get compensated.